Gigantic scope that succeeds, as well as a sincere trek into social issues without coming off preachy. That it raised the bar unfairly for next year’s Thor: Ragnarok. It’s been a handful of years since The Avengers first banded together, and the resulting global damage done has finally caught up with them. A government bill demanding they succeed to the United Nations is drawn up, though Steve Rogers/Captain America (Chris Evans) is quick to reject it on the grounds that the system can (and often is) wrong. Tony Stark/Iron Man (Robert Downey, Jr.) on the other hand, is more than happy handing the keys over to the big boys, and refuses to budge on his lenient stance. Simple, logical, and clearly established, it is a conflict that allows Captain America: Civil War to become the best superhero movie of the year. 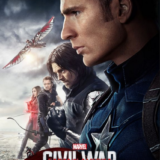 Helmed by directing duo Anthony & Joe Russo, who previously led 2014’s Captain America: The Winter Soldier, Civil War finds great impact in the human side of the superhero psyche. Rogers, still scrambling to save his brainwashed buddy Bucky (Sebastian Stan) from the feds, finds himself in the midst of torn alliances – especially after a botched rescue mission goes awry in Wakanda. From there, it’s off on a breakneck pace of fistfights and opposition to a government he once served with great eagerness. 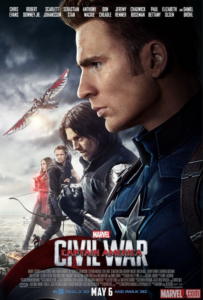 Cap’s arc over the past three films has dealt in this dwindling distrust; first with the military in The First Avenger (2011) and later with the corrupt S.H.I.E.L.D. agency in Winter Soldier, though it is here that he finally acts upon it. Evans, chiseled and radiating decency as if it came with the uniform, plays just the right blend of stoic and outspoken to anchor this otherwise massive affair. As for the rest of the heroes that drop in, kudos once again to the Russo brothers for balancing what could’ve been a disastrous talent overload. In the span of two-and-a-half hours, viewers are treated to the likes of Iron Man, Ant-Man (Paul Rudd), Falcon (Anthony Mackie), Scarlet Witch (Elizabeth Olsen), and Vision (Paul Bettany). Newcomers Black Panther (Chadwick Boseman) and Spider-Man (Tom Holland) also add their eclectic touches to the mix, as both steal the show and simultaneously drum up excitement for their upcoming solo films. Not only is each Avenger given their time to shine, but the integration of their characters feel wholly organic and ultimately beneficial to the story. Naysayers will undoubtedly go after scheming villain Zemo (Daniel Bruhl) as a source for critique, but even here, the Austrian actor adds an element of tragedy to the role that brings into question who is truly at fault. In lieu of the head-bashing blatancy of Batman v Superman: Dawn of Justice or X-Men: Apocalypse, such attention to detail is duly appreciated. In fact, by the time the film comes to a close (after some truly stunning fight scenes), it feels as though the bar of Marvel excellence has once again been raised from Iron Man (2008) and The Avengers (2012).